Throughout November, Nintendo will be hosting the Splatoon Showdown Series. It’s an opportunity for fans of the game to battle in open, online tournaments and win prizes along the way. 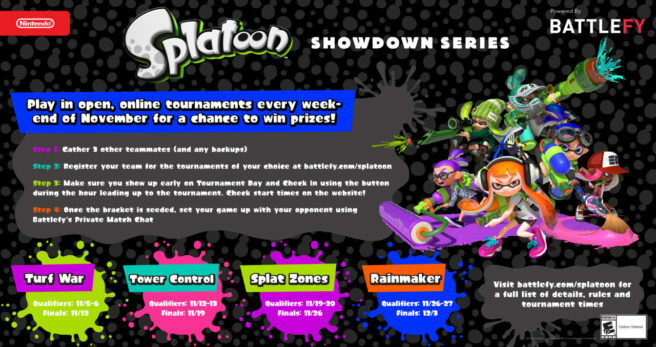 Separate events for Turf War, Tower Control, Splat Zones, and Rainmaker are planned. You’ll need to gather three teammates along with any backups and sign up on Battlefy. On the day of the tournament, show up early and use the check in button. After the bracket is seeded, you can set your game up with opponents via Battlefy’s Private Match Chat.